ArtyFartyAnnie: Counterfeit Kit January 2018 - Fresh Start!! Counterfeit Kit January 2018 - Fresh Start!! I'm totally over Christmas, so for my version I played down the red and perked up the pink, also picking up the soft blues and shades of green and throwing in a splash of yellow. I love the little car print in the inspiration kit, so I pulled out one from a recent Quirky Kit which is similar but without the Christmas angle, and pulled all my colours from there. The "hello" is simply die cut from an old file divider using my trusty Cuttlebug, and the "smile" was cut once from clear acetate and again from paper, then I glued the layers together with my Zig glue pen. They look quite good IRL but hard to get a good photo of. There will be lots of inspiration over at CKC throughout the month - check it out and why not have a go yourself?! 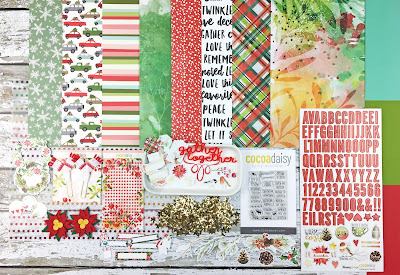 Yay for coming back and yay for a fabulous January kit! I love where you took the inspiration and your kit is very much what I had in mind as an alternative to the festive feel of the original when I first picked it! Your forged words are super simple and great - the best type of forgery! Great to have you back Annie! What a splendid idea. I love the kit you've created and also the idea of viewing things with fresh eyes. I'm finally able to get into my s/crap room. It was the dumping ground for all things over the Christmas period when we had house guests installed in my overflow room. Now to find Mr Mojo - s/hes missing in action right now. Wonderful kit, loving the tags you added and the stamped ones also. Looking forward to seeing your creations. Perfect kit Annie. Your touches of pink are inspired. Thanks for joining us again! I love the fresh and pretty colors of your kit and how you concentrated on the pinks and soft colors when you put it together. Your handmade tags are very cute too. Love your kit! This is my first time ever playing along and your kit is very inspiring!